In section 4.6 of my original article I addressed Mattogno’s attempt, amusingly based on the fact of large-scale postwar robbery digging in the Belzec area after the war, that Prof. Kola’s findings as to the layout, area, volume and number of the graves are "completely random". I demonstrated that most of the graves identified by Prof. Kola have a regular geometric shape belying the assumption that they were made or transformed by robbery diggers, and that the possibility of several original graves merging into one bigger grave was mentioned in Prof. Kola’s descriptions of the graves where it was found to have occurred, namely in graves nos. 8, 14 and 20. In his response, Mattogno argues – after repeating his claim that Prof. Kola "was supposed to furnish the 'material proof' of the alleged extermination at Bełżec" – that Prof. Kola’s allowance for modifications of the original grave structures due to subsequent factors like robbery digging did not translate into a quantitative reservation as to the number and volume of graves he established. Indeed Prof. Kola’s writing suggests that he was able to determine where factors posterior to the making of the original graves had or may have had an effect on their shape and size, while not showing if and how he quantified the effect of these factors. The former means that assuming a generally smaller surface and volume of the original graves than was established by Prof. Kola is an undue generalization. The latter may have been due not only to the difficulty of establishing said quantitative effect, but also to the not unreasonable consideration that this effect must have been minimal, as backfilling, covering up the traces of the camp and robbery digging could cause grave walls to collapse only between graves that were very close together. Mattogno has a problem with my demonstration that most of the graves identified by Prof. Kola (26 out of 33, according to my assessment) have a regular geometric shape that can hardly have been the work of robbery diggers, and he tries to solve this problem by claiming that Prof. Kola’s drawings of the outline of the graves are mere "arbitrary conjectures". This claim is supposed to be supported by the fact that, when connecting the red dots indicating drillings in mass graves the map on page 70 of Kola’s book in the manner done by Mattogno, you obtain odd figures that are rather different in shape and in number (21 instead of 33) from the mass grave areas drawn by Prof. Kola in the map on page 19 of the same book and in a map drawn by Robin O'Neill. Not exactly a convincing argument, to put it politely. Just because Mattogno doesn’t understand the methodology applied by Kola in establishing the shapes and sizes of the graves based on core drilling results (he obviously didn't do it by just connecting the red dots on the map of core drillings on page 70 of his book), this doesn't mean that Kola indulged in "arbitrary conjectures". If he had, he would not have been doing the job he had been hired for, which was to identify the areas containing human remains so that these would not be disturbed during the planned building of a memorial covering the whole former camp site. And if anything can be called arbitrary here, it is Mattogno's somewhat puerile dot-connecting exercise. The illustrated descriptions of the mass graves in Prof. Kola’s book] mention the number of drills that were used to estimate the shape and size of a mass grave in each case. Taking this information into account helps to group (to the extent permitted by the accuracy of Kola's map of core drillings on page 70 and my poor drawing skills) the dots presumably corresponding to drills on the basis of which Kola estimated the shape and size of each mass grave, into units that a) bear some resemblance to the mass grave shapes shown on page 19 of Kola's book (Mattogno's "Documento 3") and b) match the number of these shapes (33), as shown in the figure below. This alone should be sufficient to show that Prof. Kola's estimating the shapes and sizes of the mass graves on the basis of his core drilling finds was not nearly as "arbitrary" as Mattogno would like his gullible readers to believe. It would have been useful, for sure, if Prof. Kola had included in his book not only the plan and section of each grave, but also an explanation understandable to non-archaeologists of how he estimated a mass grave's shape and size based on the core drills in each case. 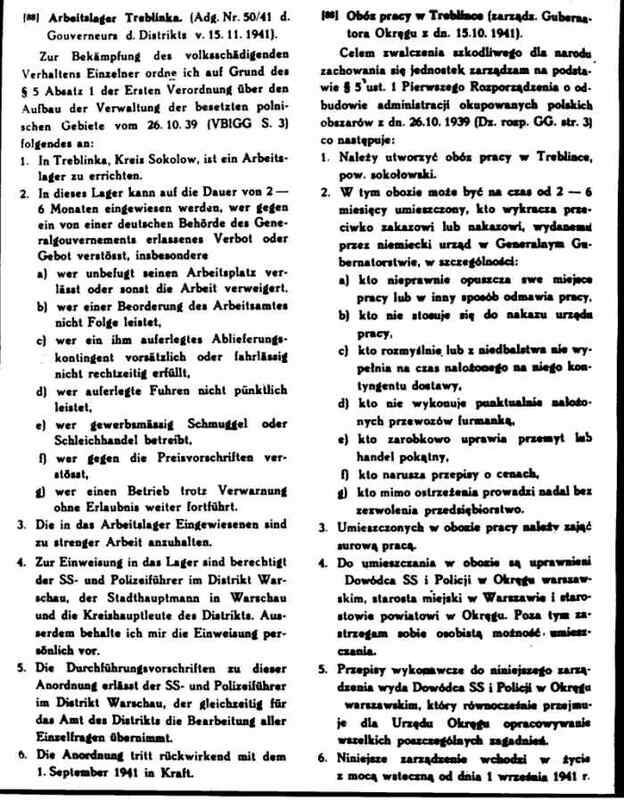 Such explanation is probably part of the more detailed archaeological documentation that Prof. Kola delivered to the Council of Protection of Memory of Struggle and Martyrdom in Warsaw, but including some of it in the book would have made it more difficult for our "Revisionist" charlatan to accuse the archaeologist of "arbitrary conjectures". After this unfortunate exercise, Mattogno regurgitates his nonsense about the irregular location and shape of the mass graves, which was already discussed before, together with Mattogno’s equally nonsensical musings about contradictions between Prof. Kola's findings on the one hand and Reder's testimony or postwar Polish excavation finds on the other. 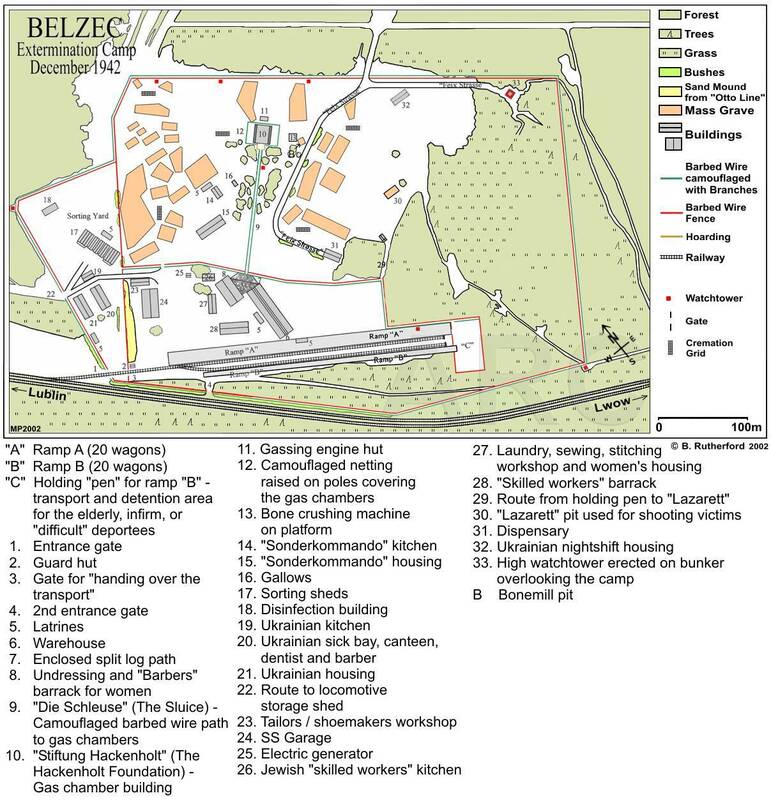 This is followed by an irrelevant comparison with the Belzec map in Arad’s book, which on the one hand is "at least rational" as concerns the shape and alignment of the mass graves but on the other hand suggests that certain camp installations (quarters, kitchen, hygienic installations, etc.) were "located right next to mass graves or even on top of them". The fuss he makes in regard to Arad's map is one Mattogno’s silliest arguments. If the map drawn by Arad, alone or when confronted with O’Neill's or Prof. Kola's maps, points to an utterly improbable placement and arrangement of the graves, this means only one thing: that Arad’s map, based on eyewitness recollections alone and obviously neither drawn to scale nor meant to do anything other than give the reader a rough idea of the layout and features of Belzec extermination camp, is inaccurate in several respects, and therefore should be discarded in favor of more precise maps like this ones made by W. Rutherford, which are drawn to scale and based not only on descriptions provided by eyewitnesses (who, as every trial judge knows, are not necessarily the most reliable source as concerns measurements, geographic directions and the relative position and size of objects) but also on the results of archaeological investigation. In another display of his schizophrenia in dealing with eyewitness testimonies, Mattogno then invokes the map drawn by the former SS-Unterscharführer Robert Jührs , which shows only one area of mass graves in the camp’s north-western corner. From this one is apparently supposed to conclude that those of the graves identified by Prof. Kola that are not in the area of what Jührs called the "field of graves" (Gräberfeld) – nos. 1, 2, 3, 4, 5, 15, 18, 19 and half of grave no. 14, with a total volume of 7,775 cubic meters, according to Mattogno – were not graves made to bury bodies during camp times but holes that subsequently came into being and into which cremation remains (and apparently also the whole corpses found by Prof. Kola in graves 1, 3 and 4) somehow made their way from the original graves. 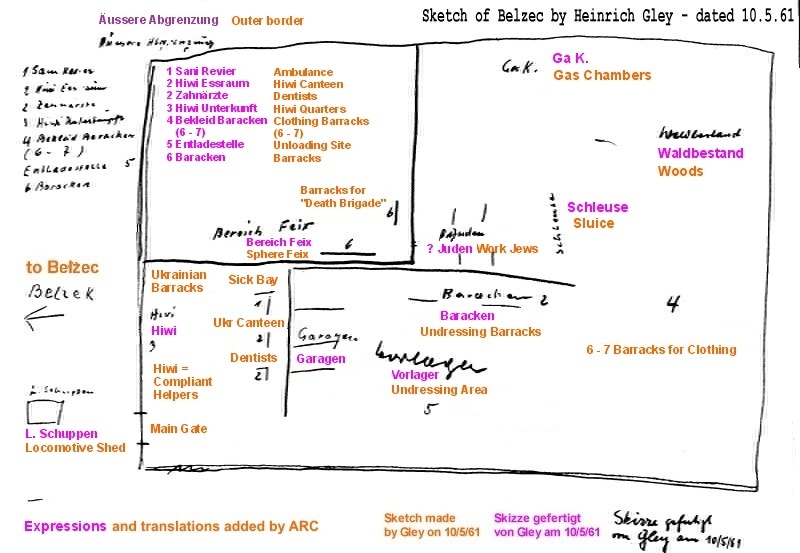 If, as per Mattogno’s infantile reasoning, Jührs’ failure to draw the graves in the eastern/northeastern sector of the camp means that there were no graves in this area, then Heinrich Gley's sketch made at about the same time as Jührs’ means there were no mass graves at all at Belzec, for none are mentioned on Gley's sketch. And yet it was Gley who provided a detailed description of the emptying of the mass graves and the burning of the corpses. What is more, the graves in the eastern/northeastern sector not drawn by either Jührs or Gley were the ones in which Polish investigators conducted excavations in 1945, leading to the discovery of huge amounts of human ashes and also larger remains like bones, as documented in the reports quoted from by Mattogno. Elementary logic has a very simple explanation for these "contradictions": the very rudimentary maps of Jührs and Gley are woefully incomplete, period. But elementary logic has never been the strong point of "Revisionism". Mattogno’s projecting onto the mass graves of Belzec extermination camps the comparatively low grave space occupation at Treblinka I labor camp was addressed in section 4.7 of my original article, where I pointed out that the number of bodies buried per cubic meter in other mass graves at other places, using other methods and with other purposes in mind, is of no relevance whatsoever to how the available grave volume was used at Belzec or at another of the camps of Aktion Reinhard(t). In his response, Mattogno calls his rather unrealistic projection (to put it politely) a "comparison with reality" and claims that my argument, supported by evidence whereby at the Aktion Reinhard(t) extermination camps the corpses were carefully placed into the graves so as to make the best possible use of the available grave volume, is a) based on mere conjecture and b) contradicted by the testimonies of Reder and Gerstein, as he supposedly demonstrated before. Wirth hat dort mit seinen Leuten, mit Franz, mit Oberhauser, und Hackenholt, durchexerziert, da mußt-sollten die drei Leichen in die Grube legen, damit Wirth weiß, wieviel Platz er braucht. There [at Belzec] Wirth together with his people, with Franz, with Oberhauser, and Hackenholt, experimented, the three had to-were supposed to lay corpses into the graves so that Wirth knows how much space he needs. In order to further illustrate to what extent the mass graves were filled at the Aktion Reinhard(t) extermination camp, I mentioned the complaint raised in October 1942 by the Wehrmacht local commander of Ostrow about the unbearable stench from the corpses of the "not adequately" buried Jews at Treblinka, which apparently carried as far as this gentleman's command post, 20 kilometers away from the camp. I argued that such phenomena of far-reaching environmental smell pollution are not compatible with the generous use of the grave volume for relatively few corpses in the mass graves found at Treblinka I labor camp, but they are certainly compatible with an extermination camp’s huge mass graves filled to bursting with corpses that had not simply been thrown in there but carefully placed in such a way as to allow for putting the greatest possible number of corpses into each pit. Mattogno, who in characteristic puerility calls my argument "simply ridiculous" in retaliation for my having applied this term to his apples-and-oranges comparison between Treblinka I labor camp and Belzec extermination camp, interprets the Wehrmacht officer's mention of the Jews at Treblinka not being sufficiently or adequately buried as meaning that the corpses were covered with an insufficiently thick layer of soil. He disingenuously asks how this is supposed to be related to a best possible use of grave space, as if he had not understood my argument that the enormous amount of decomposing human corpses packed into the graves was what accounted for the far-ranging smell pollution in question, which a labor camp's mass graves containing a much lower number of corpses would not have produced. 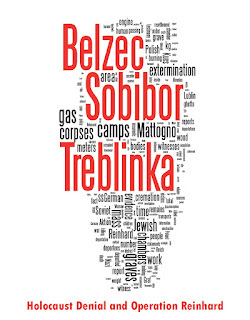 And he claims that there's nothing to exclude that the document in question referred "to the abovementioned 6,800 corpses buried near Treblinka I". It is noteworthy how readily Mattogno gives up some of the nonsense he produced together with Jürgen Graf in their Treblinka book (where they argued that the few hundred bodies found by the Soviets and Poles in mass graves in the Treblinka I area were "the bodies of all – or nearly all – who died there", and that the violation of these mass graves "alleged" by judge Łukaszkiewicz was "presumably done in order to be able to exaggerate the number of victims of Treblinka I" ). Now Mattogno drops the conspiracy theory regarding judge Łukaszkiewicz investigation of the Treblinka I mass graves (where the bodies could not be counted because the graves had been desecrated and the bodies mostly removed, for which reason the judge estimated the number of dead at 6,500 minimum based on the area and volume of the graves) in order to "explain" the environmental problem created by the stench of corpses as resulting from "circa 6,800" corpses in the Treblinka I mass graves. 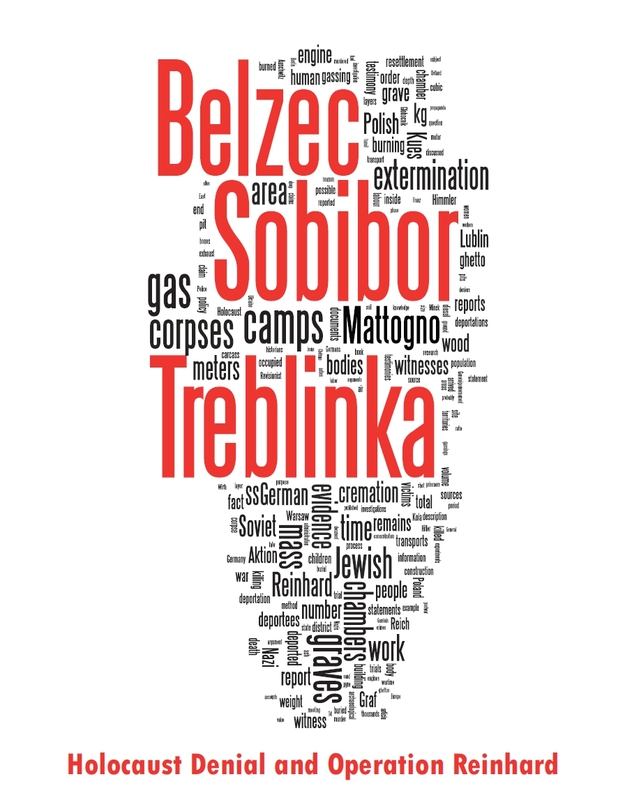 The Treblinka I labor camp existed from November 1941 to late July 1944 , i.e. for about 32 months or 960 days. It is assumed to have taken the lives of about 10,000 inmates by historians, 6,800 by Mattogno, which would mean an average mortality rate of 7 to 10 per day. Now, are we asked to believe that a daily average of only 7 to 10 bodies could not have been buried deeply enough, and that their decomposition released such a high amount of foul gasses that the smell thereof disturbed the camp's neighbors miles away? The stench emanating from the Treblinka extermination camp is described by related eyewitnesses as having been noticeable a long distance away and nauseating to the point of inducing vomit as one got closer to the place. The Ostrow Wehrmacht commandant's documented complaint corroborates and is corroborated in this sense by the vivid descriptions of several eyewitnesses. Are we asked to believe that this smell, which polluted the air miles away and was so unbearable near Treblinka that it made those not used to it puke, came from the burial of at most 10,000 corpses over a period of 32 months, at an average of at most 10 per day? Are there any reports or eyewitness descriptions of environmental smell disturbance from a camp with an average mortality of no more than 10 per day? I don't think so. Reports and complaints about decomposition stench are usually related to the presence of large numbers of decomposing corpses, carcasses or other organic matter at a given place and time. Stench disturbing the environment far away from the decomposing organic matter is usually reported in connection with landfills and with the mass burial of carcasses. The mass burial sites used during the 2001 UK FMD outbreak were limited in number and large in size (their capacity ranged from 200,000 to 1,000,000 sheep carcasses), and the issues of disturbing odor emanating from them were obviously related to the amount of decomposing carcass matter. This shows that odor issues in connection with carcass disposal can become a public concern when large numbers of carcasses (tens or hundreds of thousands) are buried at one place within a relatively short period of time. 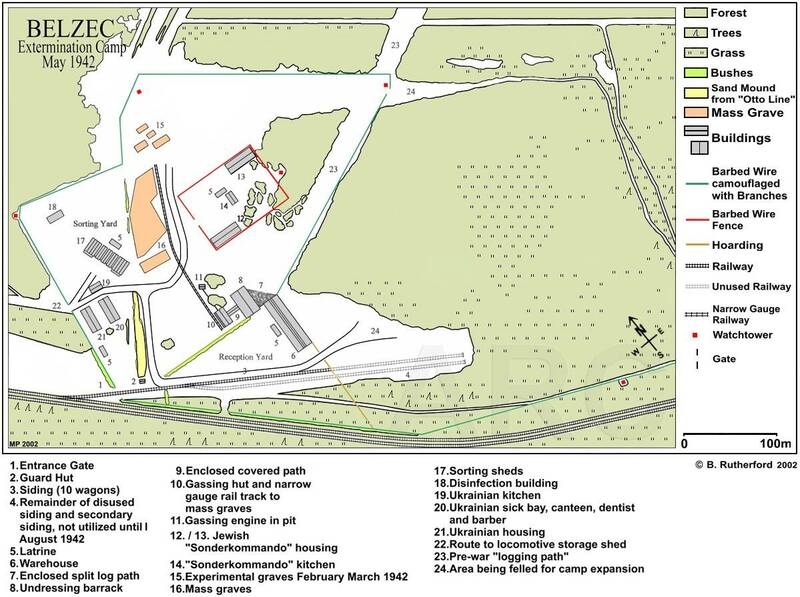 The reports and complaints about the smell of corpses emanating from the Treblinka death camp clearly suggest a similar situation, with the difference that the mass burial site contained not animal carcasses but human corpses, and that they were buried with less concern for the environmental impact resulting from their decomposition. What I still haven’t found, on the other hand, is a report about smell complaints (especially from far way) related to a site where the amount of decaying organic matter is equivalent to the at most 10,000 victims of Treblinka I labor camp and was buried there over a period of 960 days. And I don't think Mr. Mattogno, who has again shown how removed from reality he is, can provide such example. Muehlenkamp concludes by alleging that I am "comparing apples with oranges, a popular tactic "Revisionist" hoaxing". As I have shown above, it is my critic who is comparing manure with human bodies, a popular tactic of "Holocaust" hoaxing. Controversie, Pages 52-54; see also the recently published English translation. Carlo Mattogno on Belzec Archaeological Research - Part 4 (4). Mattogno apparently believes or expects his readers to believe that locals searching the area for valuables over a period of decades and bringing to the surface "ash from the corpses and from wood, charred bones as well as bones that were only partially charred", as mentioned by the Zamosc prosecutor on 11 April 1946, and "the great number of human bones spread all over the site of the former camp" that is mentioned by eyewitness Stanislaw Kozak (both quoted in Mattogno, Belzec, page 89) are compatible with the mortality among some thousands of forced laborers in 1940 and among deportees supposedly being transited through Belzec to the Nazi-occupied Soviet territories in 1942. Refuted in section 1 of this riposte. Kola, Belzec, page 39: "The largest graves were also registered in that part. One can not exclude, however, that several of them (reported as graves of a big volume) were previously some separated smaller ones, which borders mixed either during covering them with soil, covering the traces of the camp up after closing the camp down or result of burglary searches after the war. "Page 40: "In the first zone, as we can suppose, connecting smaller neighbouring graves into bigger ones by destroying earth walls separating them was observed. That is why the bigger graves show clearly former original pits." See scans of these drawings in section 2 of my original article. Controversie, Documento 8 on page 70. Kola, Belzec, pages 21 to 39. Descriptions are wholly or partially quoted in sections 3 and 4.5 of my original article; regarding plans and sections of each mass grave see previous note. See section 2 of this riposte. Belzec Camp May 1942; Belzec Camp December 1942. Controversie, Documento 10 on page 72. See section 3 of this riposte. Sketch made by SS man Heinrich Gley in 1961. Mattogno, Belzec, pages 79/80; see especially the coroner’s report of 13 October 1945: "During the inspection of the area of the extermination camp, particularly during the excavations at the place of the cemetery on October 12, 1945, a large number of human bones were found, such as skulls, parts of skulls, vertebrae, ribs, collarbones, shoulder blades, arm bones, lower legs, wrists, fingers, pelvic bones, thigh bones, lower legs, and foot bones. Some of the bones mentioned are either partly burnt or had not been burnt at all. Except for a few skulls showing rotting scalp and hair, the majority of the bones are free from soft tissue." Controversie, Pages 54/55; see also the English translation. Talk about rational use of mass grave space for corpse/carcass disposal, Chapter 1 of the USDA/APHIS National Agricultural Biosecurity Center Consortium's publication "Carcass Disposal: A Comprehensive Review" mentions some estimates about the amount of grave space required for carcass disposal: "Excavation requirements in terms of the weight of mortality per volume were estimated as 40 lbs/ft3 (1,080 lbs/yd3) (Anonymous, 1973), and 62.4 lbs/ft3 (1,680 lbs/yd3) (USDA, Natural Resources Conservation Service, Texas, 2002).". The lower concentration given here, 40 lbs/ft3, corresponds to 1,412.6 lbs/m3 or 640,7 kg/m3. That's about 19 (precisely 18.84) human beings weighing 34 kg on average. Currently featured on YouTube: Part 1/7; Part 2/7; Part 3/7; Part 4/7; Part 5/7; Part 6/7; Part 7/7. Lanzmann, Suchomel Interview, Part 3/7 of YouTube feature. The record of this complaint is translated in Christopher Browning’s expert opinion Evidence for the Implementation of the Final Solution: "OK Ostrow reports that the Jews in Treblinka are not adequately buried and as a result an unbearable smell of cadavers pollutes the air." Mattogno & Graf, Treblinka, pages 88/89. Arbeitslager Treblinka. (Adg. Nr. 50/41 d. Gouverneurs d. Distrikts v. 15.11.1941); ARC page Treblinka Labour Camp. "Suchomel: Yes, just once, the first day. We puked and wept. "I drove there, with an SS driver," he said. "We could smell it kilometres away.(...) The smell was indescribable; the hundreds, no, the thousands of bodies everywhere, decomposing, putrefying." "When we reach Treblinka station the train is next to us again - there is such an awful smell of decomposing corpses in the station, some of us vomit." Examples: "The air in Kigali was heavy with the stench of corpses. Up to 20,000 have been killed in six days." – The Independent, 13 April 1994; "Many villages and resorts are now mud-covered rubble, blanketed with the stench of corpses after the 9.0 magnitude quake. Thousands of bodies rotting in the tropical heat were tumbled into mass graves, but health officials said polluted water posed a much greater threat than corpses." – "Tsunami Death Toll Jumps Over 120,000", by Tomi Soetjipto and Dean Yates, Reuters, December 30, 2004; "The scar on the hillside has become a mass grave for the victims of the disaster. A line of young soldiers, their faces covered by blue masks against the stench of decomposing bodies, stand guard." – "China earthquake: mass graves for the dead, 5 million homeless", by Jane Macartney and Sophie Yu, The Times, May 17, 2008. From Chapter 1 of the USDA/APHIS National Agricultural Biosecurity Center Consortium's publication "Carcass Disposal: A Comprehensive Review", emphases mine: "The most notable actual environmental pressures associated with burial included odor from mass burial sites and landfills, and burial of items such as machinery and building materials during the cleansing and disinfection process on farms. […]For purposes of this report, the term "mass burial site" is used to refer to a burial site in which large numbers of animal carcasses from multiple locations are disposed, and which may incorporate systems and controls to collect, treat, and/or dispose of leachate and gas. [...] The scale of the 2001 UK FMD epidemic presented unprecedented challenges in terms of carcass disposal, prompting authorities to seek sites on which mass burials could be undertaken. A total of seven sites were identified as suitable and work began almost immediately to bring them into use (5 of the 7 sites were operational within 8 days of identification). In total, some 1.3 million carcasses (about 20% of the total 6 million) were disposed of in these mass burial sites (National Audit Office, or NAO, 2002, p. 74).[...] The total land area occupied by the seven mass burial sites in the UK ranged from 42 to 1,500 acres (NAO, 2002).[...] The estimated total capacity of the various UK mass burial sites ranged from 200,000 to 1,000,000 sheep carcasses (each approx. 50 kg [about 110 lbs]) (NAO, 2002). [...] This site, one of the last to be opened and therefore benefiting from design and construction knowledge gained from the previous sites, was constructed more to landfill specifications with lined pits. Despite this, significant odor issues presented problems adjacent to the site and to surrounding communities, depending on wind direction.[...] The potential effects arising from burial will be similar regardless of the technique used (e.g., trench burial vs. landfill); however, the likelihood and scale of the effects may differ. Another important consideration is the total volume of material buried; the impacts resulting from burial of 30 carcasses would likely be of an entirely different magnitude than those resulting from burial of 30,000 carcasses. [...] In December 2001, the UK EA published an interim assessment of the environmental impact of the outbreak (UK Environment Agency, 2001b). The most notable actual environmental pressures that were identified included the following:[...] Odor from mass burials and landfill sites.[...] In May 2001, as a result of complaints regarding the odors emanating from the mass burial site at Birkshaw Forest, monitoring of the air quality near the site was performed to determine the presence of compounds that may be injurious to human health (Glasgow Scientific Services Colston Laboratory, 2001)." Controversie, pages 42-45; section 4.2 of this riposte. Controversie, page 55; quote is from the English translation.